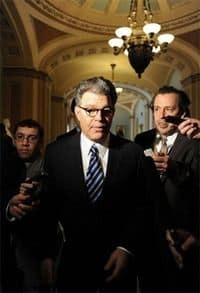 Senator Al Franken today introduced the Student Non-Discrimination Act in the Senate to combat bias based on actual or perceived sexual orientation or gender identity. The ACLU reports: "The Student Non-Discrimination Act (SNDA) would help to end entrenched biases towards lesbian, gay, bisexual and transgender (LGBT) students in our education system. A similar bill was introduced in the House of Representatives in January by Rep. Jared Polis (D-CO) and currently has over 100 co-sponsors. The American Civil Liberties Union strongly supports these bills and urges swift action by both chambers." The ACLU says it would help them in cases such as the one involving Itawamba School District in Mississippi and Constance McMillen, who was forbidden from bringing her female date to the prom. Jared Polis introduced a similar measure in the House in January.